Hazrat Baba Fariduddin Masood Ganjshakar‎ (رحمتہ اللہ علیہ) Persian (1173-1266) or (1188 (584 Hijri) – May 7, 1280 (679 T-lijri)), commonly known as Baba Farid was a 12th century Sufi preacher and saint of Chishti Order of South Asia. Baba Farid‎ (رحمتہ اللہ علیہ) is generally recognized as the first major poet of the Punjabi language and is considered one of the pivotal saints of the Punjab region. Revered by Muslims and Hindus, he is also considered one of the fifteen Sikh Bhagats within Sikhism and his works form part of the Guru Granth Sahib, the Sikh sacred scripture. Baba Fareed‎ (رحمتہ اللہ علیہ) was born in 1188 or 1173 CE (584 Hijri) at Kothewal village, 10 km from Multan in the Punjab region of Pakistan, to Jamal-ud-din Suleiman‎ (رحمتہ اللہ علیہ) and Maryam Bibi (Qarsum Bibi)‎ (رحمتہ اللہ علیہ), daughter of Sheikh Wajih-ud-din Khojendi‎ (رحمتہ اللہ علیہ). He was a descendant of Farrukh Shah Kabuli‎, the King of Afghanistan. He was the grandson of Shaykh Shoaib‎ (رحمتہ اللہ علیہ) who was the grandson of Farrukh Shah Kabuli, the king of Kabul and Ghazni. When Farrukh Shah Kabuli was killed by the Mongol hordes invading Kabul, Farid’s‎ (رحمتہ اللہ علیہ) grandfather Shaykh Shoaib‎ (رحمتہ اللہ علیہ) left Afghanistan and settled in the Punjab in 1125. 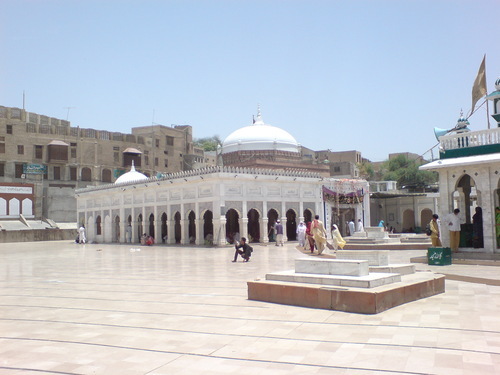 Hazrat Baba Farid Gunj e Shakar‎ (رحمتہ اللہ علیہ). Baba Farid‎ (رحمتہ اللہ علیہ) received his early education at Multan, which had become a centre for education; it was here that he met his master Murshid, Qutbuddin Bakhtiar Kaki‎ (رحمتہ اللہ علیہ), a noted Sufi saint, who was passing through Multan, from Bagdad on way to Delhi. Upon completing his education,Baba Farid‎ (رحمتہ اللہ علیہ) left for Sistan, and Kandahar and went to Mecca for the Hajj pilgrimage aged 16. Once his education was over, he shifted to Delhi, where he learned the doctrine of his Master, Qutbuddin Bakhtiar Kaki‎ (رحمتہ اللہ علیہ). He later moved to Hansi, Haryana. When Qutbuddin Bakhtiar Kaki‎ (رحمتہ اللہ علیہ) died in 1235,Baba Farid‎ (رحمتہ اللہ علیہ) left Hansi, and assumed the role of spiritual successor of his Master, though he settled not in Delhi but in Ajodhan (the present Pakpattan, Pakistan). On his way to Ajodhan and passing through Faridkot, he met the 20-year old, Nizamuddin Auliya‎ (رحمتہ اللہ علیہ), who went on to become his disciple, and later his successor (khalifa). Baba Farid‎ (رحمتہ اللہ علیہ) married Hazabara‎ (رحمتہ اللہ علیہ), daughter of Sultan Nasiruddin‎ Mahmud‎ (رحمتہ اللہ علیہ). He died on 5th of Muharram, Tuesday, 7 May 1266 CE (679 Hijri) during Namaz. His darbar is in Dera Pindi, and his name is Khawaja Shaikh Muhammad Paak Ghareeb Nawaz‎ (رحمتہ اللہ علیہ). His epitpah reads, “There is only one Fareed, though many spring forth from the bud of the flower”. His descendants, also known as Fareedi, Fareedies and Faridy, mostly carry the name Farooqi, can be found in India, Pakistan and the Diaspora. Gunahan Bharehan main pheraan, Lok kahain dervish "
TRANSLATION: Laden with my load of misdeeds, I move about in the garb of black garments. And the people see me and call me a dervish. Challaan tey bhijjay kambli, rahan ta jaaey neouney "
TRANSLATION: My promise with my love, a long way to go and a muddy lane ahead If I move I spoil my cloak; if I stay I break my word. One of Baba Farid’s‎ (رحمتہ اللہ علیہ) most important contributions to Punjabi literature is his development of the language for literary purposes. Whereas Sanskrit, Arabic, Turkish and Persian had historically been considered the languages of the learning, the elite and in monastic centers, Punjabi was generally considered a lesser refined folk language. Although earlier poets had written in a primitive Punjabi, there was little beyond Punjabi literature besides the range of traditional and anonymous ballads. By using Punjabi as the language of poetry,Baba Farid (رحمتہ اللہ علیہ) laid the basis for a vernacular Punjabi literature that would be developed later. Amongst, famous people who visited his shrine over the centuries, are famous scholar-explorer, Ibn Battuta, who visited in 1334, and Founder of Sikhism, Guru Nanak Dev, who met then head of the shrine, Sheikh Ibrahim, twice, and his meeting lead to the incorporation of 122 verses, and four poems of Baba Farid‎ (رحمتہ اللہ علیہ), in Sikh Holy Book, Guru Granth Sahib, by the fifth Sikh Guru, Arjan Dev in 1604. The city of Faridkot bears his namesake. According to legend, Farid‎ stopped by the city, then named ‘Mokhalpur’, and did penance for 40 days, near the fort of King ‘Mokhal’. The king was said to be so impressed by his presence that he named the city, after Baba Farid‎ (رحمتہ اللہ علیہ), which today is known as ‘Tilla Baba Farid’. The festival ‘Baba Sheikh Farid Aagman Purb Mela’ is celebrated in September, each year, commemorating his arrival in the city. Ajodhan was also renamed as Farid’s‎ (رحمتہ اللہ علیہ) ‘Pak Pattan’, meaning Pure City, which in time became its present name, though some sources suggest, it comes from its another meaning, ‘Holy Ferry’. ‘Faridia Islamic University’, at Sahiwal, Pakistan is named after him, and in July 1998, the Punjab Government in India, established the Baba Farid University of Health Sciences at Faridkot, the city which itself was named after him. According to a legend, it was his mother, who inspired young Farid‎ (رحمتہ اللہ علیہ) towards prayer, by placing Shakar (sugar) under his prayer mat, and when she didn’t, Farid‎ (رحمتہ اللہ علیہ) found the sugar nevertheless, this episode gave him an unmistakable spiritual fervour and later the name, Ganj-i-Shakar, meaning ‘Treasure of Sweetness’ (Shakar). Shaikh Shoaib‎ (رحمتہ اللہ علیہ) was nephew of Sultan Mahmud Ghaznavi. His mazar (shrine) is located in Pakpattan. Khawaja Nizamuddin Aulia‎ (رحمتہ اللہ علیہ) constructed his tomb. The mazar has two doors, namely Noori darwaza and Bahishti darwaza. Bahishti darwaza opens once a year and during the fair, thousands of people pass through this doorway. The door itself is made of silver, and floral designs are laid in gold sheet. Thousands of devotees come to visit the shrine daily from within the country and from abroad. His urs (death anniversary) is celebrated every year on the 5th, 6th and 7th of Muharram.